Similar to the promise of cyberspace in the late 80’s, untapped by the massification and miniaturization of microelectronics, Space is today’s new Wild West: a vast territory with boundless potential, whose time has come to be developed. Satellite services have been available for more than 30 years; however, the high up-front investments needed to build traditional satellites, in addition to long development cycles that is frequently counted in decades, produced an industry with a distinctively low rate of innovation. Space gives us a highly unique vantage point to tackle some of Earth’s most pressing problems, and yet, until now, that unique potential has been systemically underutilized. That’s the reason why Satellogic was created. With a background in software and network engineering, it was clear to us that what was needed to harbor and embrace innovation in space was to build a new, accessible distributed platform in Low Earth Orbit (LEO). The platform had to be created using inexpensive components that could be produced in short, agile development cycles. We set out to accomplish this goal. 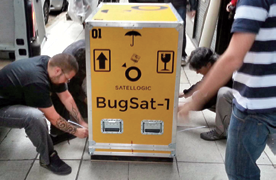 For those who may be unfamiliar with Satellogic, we are a global company building a constellation of satellites to provide affordable, commercial grade imaging and observation data for any part of the world, in high-resolution, in real-time. By operating a coordinated mesh network of imaging sensors orbiting the Earth, we aim to reinvent and improve the way we make daily decisions on agriculture, oil and gas, and many other prominent industries, while democratizing access to space-based data and making the unique vantage point of space available to every individual. 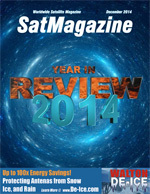 This was a big year for Satellogic. After three years of working quietly on our technology, we officially introduced the company to the world in May and launched our 3rd satellite—BugSat-1, nicknamed Tita—from the Russian launch base of Yasny in June. 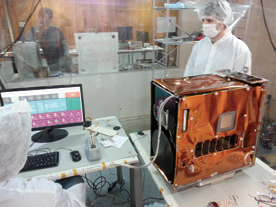 BugSat-1’s predecessors—CubeBug-1 and CubeBug—had been launched earlier, in April and November of 2013. In 2015, we plan on building an additional 15 satellites and setting up our service constellation which, in the following years, will lead to hundreds of satellites on orbit, with the ability to monitor global processes and to image every area of the globe. 2014 will be remembered as a hinge year for Earth Observation (EO), with massive companies, including Google, starting to take a vested interest in the sector. A new cadre of startups have directed their innovative approaches to materialize the promise of space, appropriating technology that belonged, until now, only to the realm of governments and big space agencies. Some of the biggest challenges we’ll face as a society in the next 20 years will concern how we manage food production and distribution, energy generation and distribution, and our natural resources. We will be able to evaluate and address these issues based on reliable data as we begin to quantify the Earth with our platform. It won’t matter if the platform is monitoring hydric stress in your backyard, pirates off the coast of Somalia, visualizing weather patterns or monitoring social conflict, the focus is on serving customers’ needs. With a formal background in Mathematics and Philosophy, Emiliano has spent the last 20+ years building technology and technology companies. He founded his first company at age 15; later, he co-founded Core Security, developing pioneering work in the Information Security and Software industries. For his work in Satellogic, he was awarded the “Most likely to impact the lives of 1 Bn people” award by NASA Ames-based Singularity University. When times are lean and everyone is concerned, thinking about budget cuts, listening becomes one of the most important skills to acquire and use in business. At Signalhorn, we focused in 2014 on talking to our customers about how they were using the services they were purchasing from us and finding out what else they wanted us to be doing for them. As a result, we gained a deeper understanding of where they wanted to take their businesses, and how we could support them in that effort. • Despite this widespread lean-and-mean business mentality, our regional customers continue to have global strategies and global aspirations. They want to grow regionally and internationally. These trends in 2014 presented us with many opportunities to help our existing customers make better use of the network and satellite services we provide to them. One example of this is the work we have been doing for Mayr Melnhof Karton, based in Vienna, Austria. The company is the world’s largest producer of cartonboard, a product familiar to anyone who ever opened a box of breakfast cereal. Mayr Melnhof operates seven cartonboard mills in Europe and 33 other plants around the world that print and fold the raw cartonboard to create packaging for food, cleaning products, beverages and a variety of other labeled goods. Some of the company’s machines produce a 12,000-pound roll of thin cardboard in eight minutes, running so fast that they cannot easily be stopped and restarted. These machines are all controlled by automated systems running on a huge network based in Vienna, making continuous and reliable communication network links indispensable. To prevent this, we provide Mayr Melnhof with backup satellite connectivity as an “insurance policy,” available in case of a general network outage, or a local disaster such as a flood or fire, which could disrupt the company’s land-based connections. 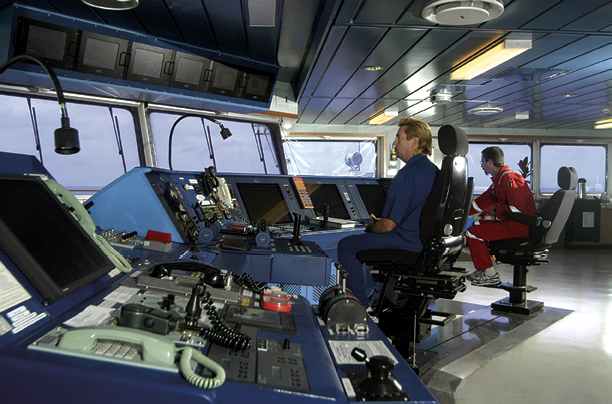 The control room of an offshore O&G rig. Photo courtesy of Signalhorn. With Mayr Melnhof and other customers, it is no longer good enough to just sit back and offer a few megahertz of satellite capacity or access to a fiber network. We focused in 2014 on really understanding our customers’ technical, security and other issues, always with a view toward how can we help them meet their financial goals. Often in 2014, we had to resell our austerity-minded customers on the benefits of Signalhorn services as part of a collaborative discussion of what they were trying to achieve in their business. In many cases, we found that, despite worrying about expenses in the short term, our customers are focused on long-term global strategies. Many of them have established footholds in particular regions but are anxious to expand, particularly into Africa and the Middle East. One such customer is KCA Deutag, one of the world’s leading energy drilling and engineering contractors. The company, based in Aberdeen, Scotland, has extensive operations in West Africa, the North Sea, Russia and Southwest Asia. The company is expanding its operations in the Middle East, and signed a contract with us to provide hybrid network connectivity to seven land rigs in Oman as well as three new rigs and a warehouse in the Khazzan gas field there. In spite of the turmoil in parts of the Middle East and Africa, we have seen few signs of customers wanting to pull back their operations, with the exception of those in Libya. Even in Iraq, we are much new commercial activity. Most companies have come to the realization that civil unrest is going to continue for a long time and is just another cost of doing business. Also in 2014, we made investments in our network with “smart” routers and other technical improvements, partnering with outside support companies to help us manage the network. We worked the bugs out of the new equipment and now have a much more responsive and robust network than we did before the work began. Along with these endeavors, our push to much greater network security and compliance to meet PCI DSS standards and more are all underway. Network security is at the top of our mind as well as for all of our customers—Signalhorn must be at the forefront of these efforts. As we move toward 2015, we feel that we are managing our own business better than ever—we worked through the same austerity exercises as many other companies—and are looking at our customers completely differently than we did a year ago. We plan to triple the size of our commercial department in 2015, adding seasoned people in the U.K., Africa, North America and Asia. In 2015, we expect that business conditions in the many nations and regions that make up the global economy will begin to improve. If that happens, we will likely see reduced focus on corporate belt tightening. However, we expect that our customers will continue to focus on obtaining the best value from their network provider—we intend to continue supporting them in that endeavor. Robert J. Kubbernus is President & CEO of Signalhorn, a global provider of network services and communications solutions with global operations that are supported by the company from their operations centers in Germany and Switzerland. He assumed the position in February of 2012 when he acquired Signalhorn (then named Satlynx) from its previous owner, GE. Canadian born, Mr. Kubbernus has more than 25 years of leadership experience in companies involved in telecommunications, IT and Network Security, e-commerce, plus other industries. Prior to purchasing Signalhorn, Mr. Kubbernus was President & CEO of TrustComm, a Houston-based telecommunications company providing satellite and terrestrial services to corporations and government organizations. TrustComm, formerly known as Skyport Global Communications, operates from the Ellington Field Joint Reserve Base and is a major provider of telecommunications services to the U.S. National Guard, FEMA, U.S. Department of Defense, and others. In 1990 Mr. Kubbernus established Bankton Financial Corp. in Toronto, Canada, and remains the company’s President and CEO. Bankton has provided private investment and investment services over the past two decades with a focus on internal investments. In 2000 he was nominated as Ernst and Young’s Entrepreneur of the Year and appointed on Venture Magazine’s list of “Most Influential People.” He has taught computer science at the university level and has served on a number of corporate boards in Canada and the United States. 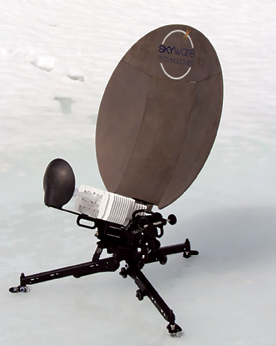 For Skyware Technologies, 2014 represented an enormous build-up toward the proliferation of new Ka-band VSAT service offerings that are scheduled to come online over the next several years. One has only to look at satellite launches that are planned between 2012 and 2016 to see evidence of this anticipation in the marketplace (please see Figure 1). Twenty-two Ka-band satellite launches are projected to be completed this year; that’s more than four times than those launched in 2012. There appears to be insatiable demand for bandwidth from consumers, governments and enterprises alike, all being driven by a dramatic rise in the use of IP for video media distribution, enterprise data collection, and audio and video communications. This new capacity will bring connectivity to an even greater base of end customers and to new applications as it drives down the cost per bit and extends coverage nearly everywhere through a host of regional and global operators. Broadband access is on the path to ubiquity and VSAT will play an important role in this. Figure 1. 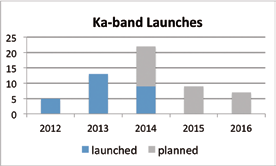 Ka-band Satellite Launches 2012-2016. Satellite data from satbeams.com and o3bnetworks.com—Data realized on October 30, 2014. In anticipation of the burgeoning demand for high quality and affordable Ka-band ground segment equipment, Skyware Technologies has invested for more than three years in a suite of platforms that are designed to address a cross section of end user market segments. These platforms range from RF transceivers for consumer broadband and enterprise remote applications as well as transportable terminals that address the demanding needs of enterprise and government customers (please see Figure 2). In addition to these platforms, we have developed products that have been optimized for large VSAT OEMs, with deployments all over the world to support regional and global services. One example of this is our partnership with Inmarsat to develop a line of integrated terminals for their first-of-a-kind Global Xpress network, for which we are an approved manufacturer. Just as the cost per bit of data service is an important metric to the adoption of satellite communications, so is the cost of purchasing and operating the necessary equipment. While a glut of new network capacity will undoubtedly tend to drive average data prices downward, we believe that the variety of technology implementations between networks will force customers to compromise flexibility or invest heavily in several terminal platforms, incurring additional capital, maintenance, transportation and training expenses. These “hidden” costs are considerable drivers of the total cost of managing an organization’s communications infrastructure. Enterprise and government customers with operations across regions or around the globe will find a great deal of value in solutions that minimize such costs. For example, media news gathering organizations that require reporters to travel to any place on the globe on a moment’s notice will benefit greatly through the use of an equipment platform that they are familiar with, able to operate easily under pressure, and are confident that the system will work anywhere needed. Without a flexible technology platform, a news bureau will be forced to purchase and manage a stable of different terminals in order to support their organization’s mission. We believe that Skyware Technologies has a role to play in driving down the total cost of VSAT connectivity through the development of versatile, modular, communications platforms – versatility that allows our customers to maximize the reuse of existing hardware investments from one application or location to another. For example, the Skyware Technologies DRC RF transceiver family (please see Figure 3) supports a wide variety of modem and hub technologies and provides electronic frequency sub-band switching and unique electronic polarization switching capabilities. These features make the DRC the most versatile Ka-band transceiver on the market and help our customers reduce their total cost of ownership by avoiding unsafe working conditions to reach the transceiver wherever it is installed (e.g., on top of a news van), increasing system reliability because of reduced need to expose the feed chain to environmental hazards, and maximizing reuse of equipment when switching between different satellites and modems. Similarly, the ATOM line of transportable terminals is designed around a modular platform such that it can be adapted in the field between networks or even VSAT frequency bands—without the need for tools. Without a doubt, we view the ongoing proliferation of new Ka-band capacity as beneficial to end users and for the competitiveness of the VSAT industry in general. However, bandwidth is only one variable in the total expense of communications and there are numerous other costs to consider when deploying new technology into a particular application. The new capacity may all be called “Ka,” but each network implementation varies enough to introduce potential hurdles in realizing all the benefits offered by choice and global availability. At Skyware Technologies, we are committed to delivering on the promise of “Ka” and preventing our customers from being bitten by the hidden cost of variety. Dr. Geen received his BEng (Hons) in Communications and Electronic Engineering in 1992, followed by his PhD in Antenna Design, both in Newcastle, UK. He began his career working in the USA designing bespoke feed chains for large Earth station antennas. Dr. Geen has nearly 20 years of experience in the design of communication systems for terrestrial and satellite applications. Following several years in Engineering management, David spent the last three years establishing and growing Skyware’s deployable terminals business for Enterprise, Media and Government applications. This was ultimately the catalyst that led to the recent spin-out of Skyware Technologies as a new and exciting company offering cutting-edge Ka-band RF electronics and terminals for the Satellite industry. Recently David was made Managing Director of the company and now strives to build on the foundations of the business he helped establish three years earlier. Approaching 2015, Spacecom’s AMOS brand is a well known name across the globe. As an emerging global satellite provider, we have moved from providing satellite services in Europe—primarily to Central and Eastern Europe (CEE) and the Middle East—to also bringing our services to all of Africa, areas of Asia and soon to Western Europe, as well. We have also introduced new technologies to maintain and ensure Spacecom’s world-wide reputation for excellence. We believe that these moves enhance our reputation for customer service and will continue to be powerful tools for our future. Since the successful launch of AMOS-4 to the 65 degrees East prime orbital position, where it serves Asia and Africa with valuable Ku- and Ka-band capacity, Spacecom has expanded into new markets that are hungry for reliable service. Today, the AMOS fleet consists of the AMOS-2 and AMOS-3 satellites co-located at the 4 degrees West orbital location serving Central and Eastern Europe, the Middle East and the U.S. East Coast, AMOS-5 located at 17 degrees East serving Africa and the Middle East and AMOS-4. 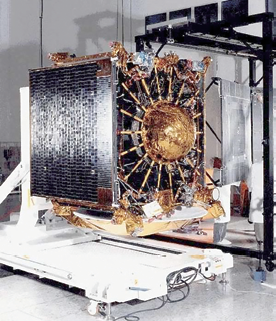 Spacecom’s AMOS-6 satellite during the build process. Together, our satellites offer a wide range of communication and broadcast services for the telecom, broadband and broadcast markets such as Direct-To-Home (DTH) and Direct Broadcast Satellite (DBS) operators, Internet Service Providers (ISPs), telecom operators, network integrators and government agencies. During the past year, we generated business in all areas of the spectrum: broadcast, broadband, government and corporate. Telecom operators are using the AMOS fleet for data backhaul and innovations in the area of Internet broadband, whereas our traditional broadcast business, especially in Africa, is enabling clients to move to digital from analog technologies. Spacecom is expanding the AMOS brand and continuing its emergence in new markets. This year we also introduced and launched a Satellite-Cellular hybrid service. Our hybrid solution for Internet provisioning is based on our providing the upchannel to the cloud via a cellphone. Here, a user sends a request to the cloud via a GSM modem and all the information is accessed from the satellite with a high throughput datalink. This is a great solution for bringing affordable broadband Internet to more users who require excellent service at a cost effective price. 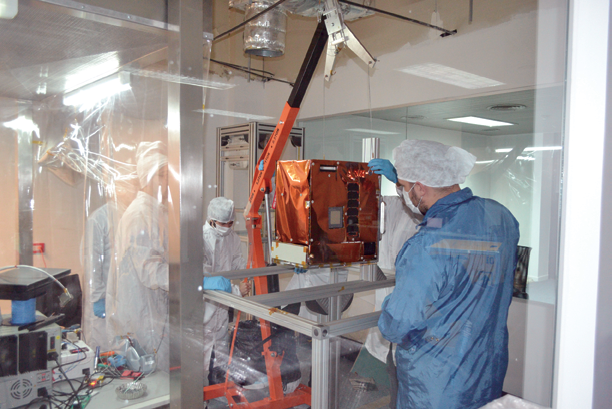 In 2015, AMOS-6 is scheduled for launch and the start of commercial operations. To be co-located at the 4 degrees West orbital position with AMOS-3, and replacing AMOS-2, AMOS-6 will be larger than both of those satellites combined and will incorporate new technologies such as High Throughput (HTS) Ka-band spot beams for improved broadband Internet access, covering Europe and Africa, as well as Ku-band technologies for new and existing clients. AMOS-6 will expand our European coverage with a new Pan-European beam. AMOS-6 will offer 39 Ku-band segments and 24 Ka-band beams to provide a wide array of services. The satellite will be fitted with numerous new technologies that include electronic propulsion capabilities to save on weight and cost. We look forward to AMOS-6 having a long service life and this satellite will assist in maintaining our leadership position in Europe. Indeed, the new satellite is important for Spacecom as it will open even more new markets that include Western Europe and AMOS-6 will also bring Ka-band spot-beams to portions of Africa. AMOS-6’s HTS capacity and attractive Mbps cost will answer the markets’ emerging needs. 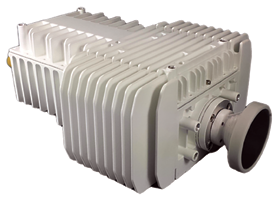 In the next few years, we see AMOS-6 playing a role in providing dual-play with UltraHD content to specific markets; 3G and 4G backhaul to smaller sites to enhance low ARPU; IP trunking; Oil & Gas platforms; and government services, among many. The satellite’s unique coverage and built-in operational flexibility are designed to concurrently provide multiple services so that our clients can engage their customers with top of the line offers to generate more business. Artistic rendition of Spacecom’s AMOS-5 satellite. In 2014, as well as into the future, Europe is a key market for Spacecom. During our two decades of operation in this region of the world, we have developed long-term relationships and partnerships with the numerous key players and major media groups. From our 4 degrees West orbital position ‘hot-spot,’ the AMOS constellation provides excellent, strong broadcast neighborhoods. Clients include DTH platforms such as T-Home SatTV (Magyar Telekom) in Hungary, a subsidiary of the Deutsche Telekom group; Xtra-TV in the Ukraine and Israel’s Yes. These DTH operators anchor our European business. With one of the strongest satellite presences in the CEE region, AMOS also works with leaders like HBO for its European cable and IPTV distribution, Ukraine’s Inter Media Group and MTV channels, among others. Africa is also important for Spacecom. Our expansion into Africa with the AMOS-5 satellite located at the 17 degrees East prime orbital position has been exciting and the opening of this market is part of our growth strategy to focus on developing markets. AMOS-5 is an excellent platform for all types and manners of broadcast, data and telecom services. 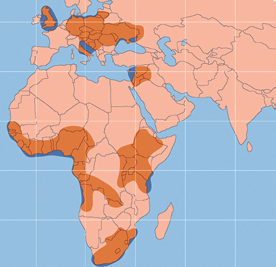 With a pan-African C-band and three Ku-band capacity, the satellite reaches all of Africa with significant signal strength and the capability to bring more bandwidth to customers. Working with governments, international corporations, local broadcasters and an array of other businesses, we are constantly moving forward over the continent. In Africa, the demand for satellite services is expanding. Broadcast is being driven by increasing numbers of HD channels as well as the growth of local or regional broadcasters. Data services are being pulled by an increase in portable and digital devices while telecom services are being positively influenced by the growth of mobile platforms that are used by more and more people as their primary method of communication. Corporate and government sectors are also growing. New contracts for digital services, including telephony and broadcast, are increasing and ushering the continent further into the digital era. As in other areas of the globe where communications services face boundaries due to geographic challenges, African countries are also investigating how to provide basic communications services for all of their population whether in urban, outlying or rural areas. Our teams are continuously working to make the future brighter. Our strategic development team is advancing programs to generate new business opportunities around the world. The AMOS brand is respected in our markets for service, response and the ability to provide solutions that work. This will continue to be the case, as well, in the future. Joining Spacecom in 2009, Eyal Copitt leads the African sales efforts. Mr. Copitt brings with him more than 20 years of worldwide consulting and sales experience, of which 15 were in the African IT and Communications Markets working with governments, private and national owned Telco’s, the finance industry and education networks. Prior to joining Spacecom Mr. Copitt served as VP Sales Africa at Gilat Satcom and as the Africa District Manager at NetApp (NASDAQ: NTAP), where he was in charge for developing new markets in the African Markets.